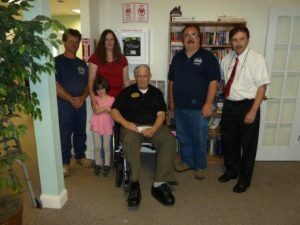 Tiny and Sons Auto Glass Donates Defibrillator to Pembroke Council on Aging. “You’ve got to give something back.” So says James “Tiny” Brown, CEO of Tiny and Sons Auto Glass on his decision to donate an automated defibrillator to the Pembroke Council on Aging. A defibrillator delivers a therapeutic dose of electrical energy to the affected heart, often restoring normal heart rhythms. An automated external defibrillator (AED), automates the diagnosis of treatable heart rhythms, meaning that lay responders or bystanders are able to use it successfully with little training. The box for the device has information on how to use it in several languages. 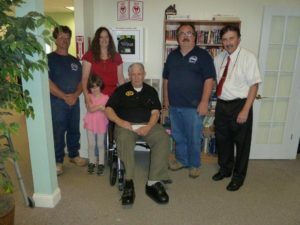 The donation of the defibrillator is another milestone in Tiny and Son’s long tradition of charitable giving, and is given in loving memory of Elaine Brown, Tiny’s wife who passed away five years ago. The defibrillator is on site at the COA at 144 Center St. Pembroke. Pembroke Fire Chief Jim Neenan will offer training on its use. Tiny has been a regular visitor to the Council on Aging every Wednesday for the “Dull Man’s Club” and other activities. While there he noticed that there was no defibrillator on site, and began to worry that if someone were to have a heart- related incident there would be no immediate way to help. “After all, we’re not getting any younger.” Tiny joked. 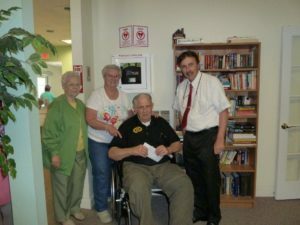 He felt that the Council on Aging probably had more need for a defibrillator than most of the organizations in Pembroke that already had them, and decided that it was something he could give to the community that has supported his business for decades.